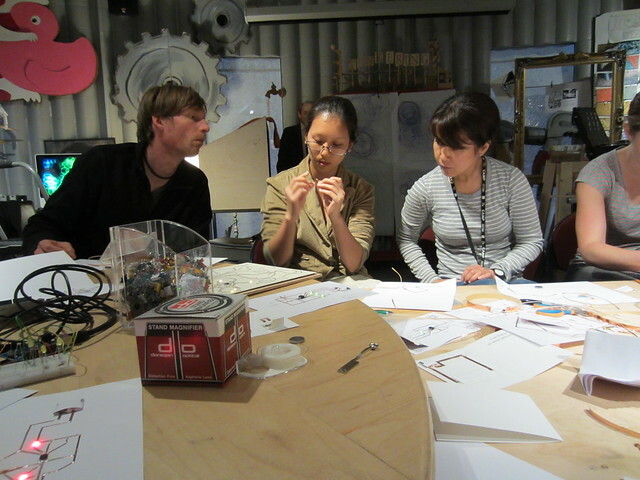 For the past couple of weeks Jie Qi from the high-low tech group at MIT media lab has been spending time in the Learning Studio sharing some of her work. 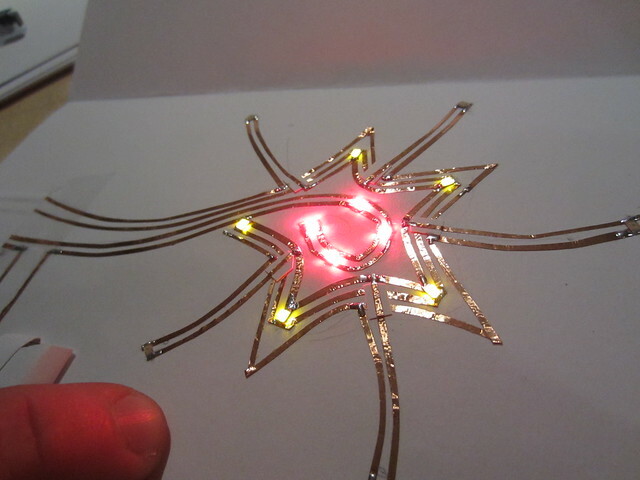 She makes paper circuits and programming micro-controllers to make LEDs flicker, blink and respond to sensors. 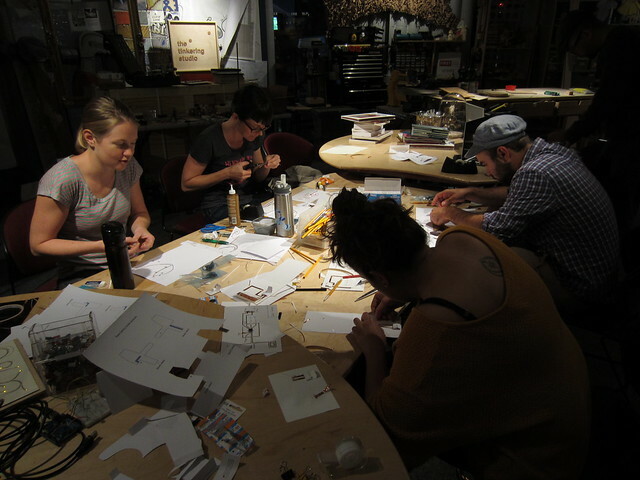 On Monday, she led a workshop for our staff group showing us some simple ways to make electrical connections on paper and providing us with the materials and ideas to complexify our designs. 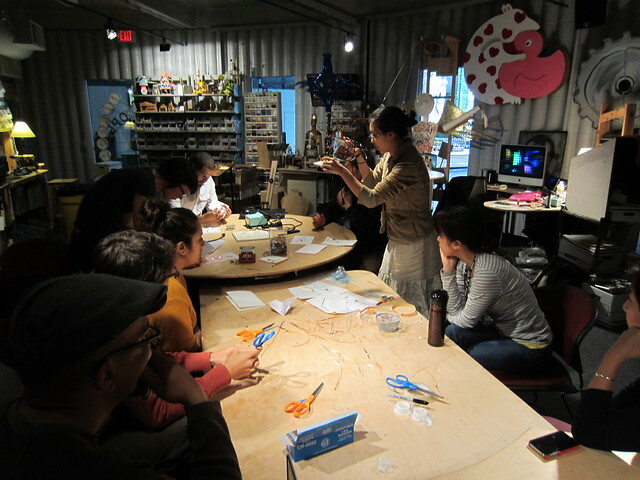 We started off by checking out some ingenious examples that Jie brought to demonstrate ways of making paper battery holders and pull tab switches. 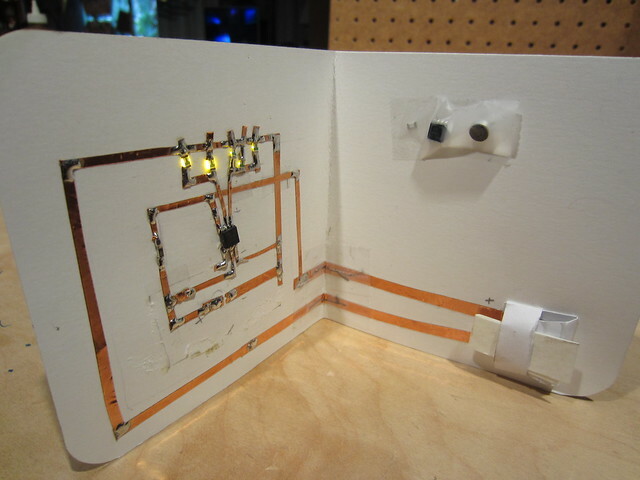 On this example, the different colored LEDs light up due to the different connections completed by the switch. 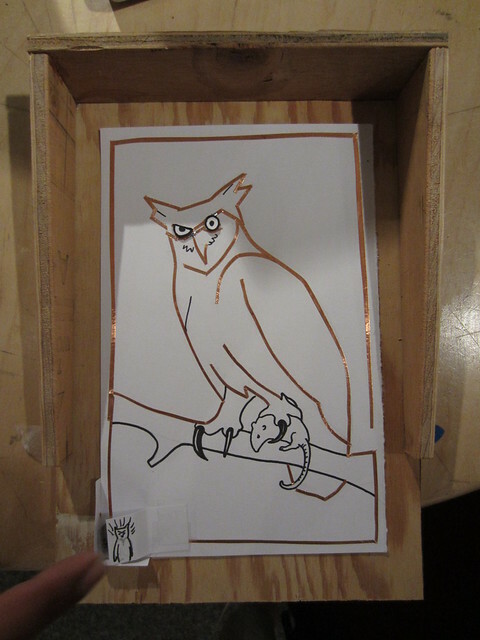 It was fun to get our hands 'dirty' with some things we've tried before like pop-ups and copper tape circuits and experimenting other new elements like microprocessors, programming, and tiny surface mount LEDs. 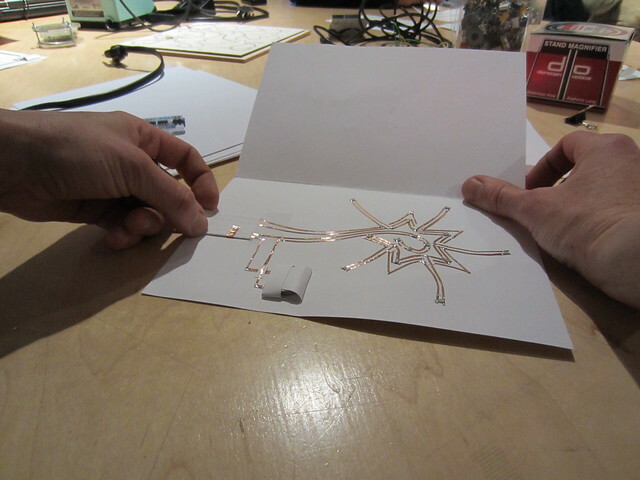 Our fist circuits were simple patterns that allowed us to familiarize ourselves with paper folding techniques and ways of manipulating the copper tape with various folds and turns. 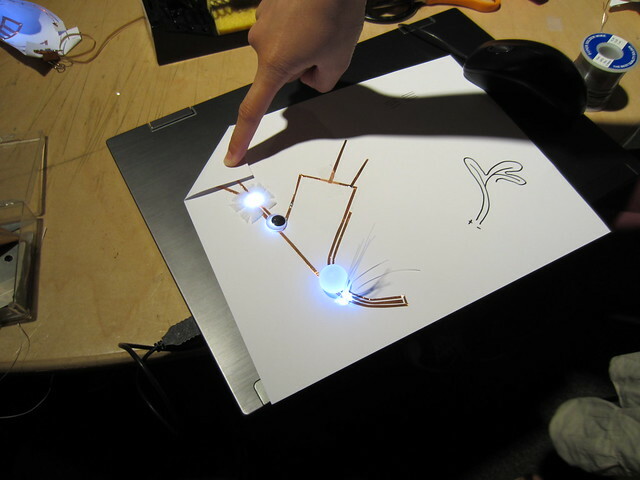 We also played with different materials like fishing line, googly eyes, tape and ping pong balls to diffuse the lights. 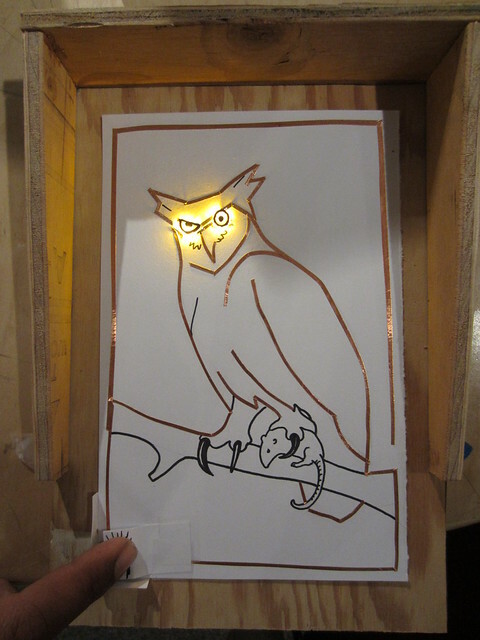 Walter created this beautiful owl with eyes that light up with the press of a button. 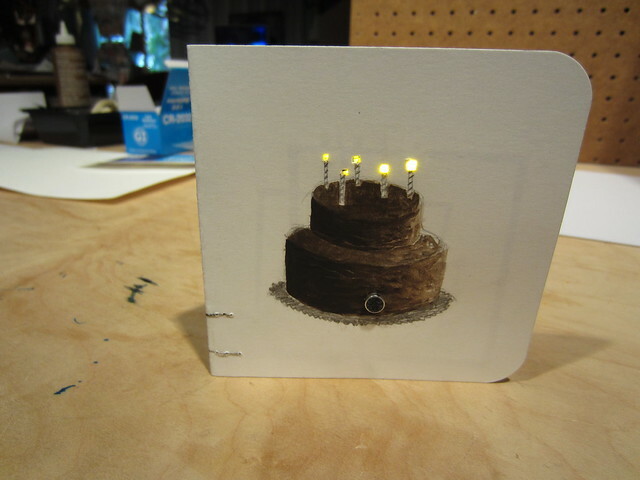 Nicole made a awesome birthday card by incorporating a microcontroller and a sound sensor so that when someone blows the candles they turn on and off. She also programmed the lights to flicker. Tomorrow we are planning to take some of these ideas out to museum floor and share them with visitors to the Tinkering Studio. 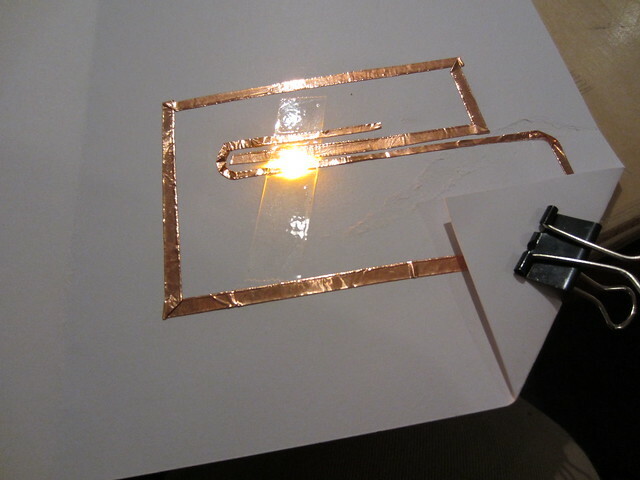 I think people will be excited to play with a mix of familiar and unfamiliar materials in a way that encourages them to think differently about electricity. Which microprocessor and programming environment did you use? Circuit diagrams for integrating them?